James D. Black was the most successful pastor Stamping Ground has ever had. He was called to that position, in January, 1838, and resigned it in March, 1867, in these words "I hereby resign the charge of your church, which I have had for thirty years. Brethren, be careful, and do not fall out by the way." He was among the most zealous, energetic, faithful, and successful preachers, that ever labored among the Baptists of Kentucky. 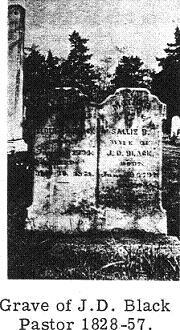 James D. Black was born in Virginia, June 24, 1794. He came with his parents to Kentucky, in 1807. His early education was very limited. He was converted to God, at the age of about fifteen years, and was baptized into the fellowship of Dry Run church in Scott county, by Joseph Redding. He was raised up to the ministry, in Long Lick church in Scott county. He was pastor, at different times, of some sixteen churches in Kentucky, besides preaching to several in Missouri, while residing in that State. He was a student and a laborer. He went to school, and was in a grammar class with his son, E. H. Black, when he was past forty years of age, and, by the aid of a Greek grammar, learned to read the New Testament in Greek, after he was fifty. He was laboring in a series of revivals, during a great portion of his ministry. He served one year as a missionary of Elkhorn Association. At the close of the year, he made the following report: "During the year, your agent has attended twenty protracted meetings, 323 have been received for baptism, at those meetings. He has baptized 261, himself, chiefly at the churches of his charge. He has preached 351 discourses, and has been engaged 121 days in actual service to this Association." He baptized about 500 in one year. During his pastorate at Stamping Ground, he baptized over 1,000 into the fellowship of that church. He kept no account of the number he baptized during his ministry, but said, during his last illness, he could not think he had immersed less than 5,000. He quitted the scenes of his labors, May 30, 1871. His last words were, "Jesus! Oh my son, how precious." His remains lie beneath where stood the old pulpit which he occupied so long and successfully at Stamping Ground. That he was a good man, many living witnesses testify; that he was a great man, his works bear record.